Aluminium Shutters have been designed as a modern, functional shutter which is aesthetically appealing for both exterior and interior use. Using only the highest quality of finishes which is backed by a 7 year warranty, Vueline 2000 will create maintenance free durability and style to your home, office, or commercial environment. Open or closed blades – at your control. 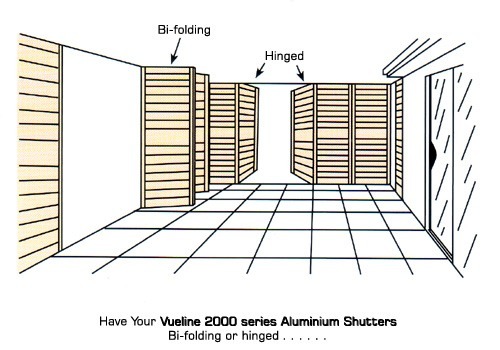 Use Vueline 2000 Series Aluminium Shutters for patios, balconies, outdoor dining areas, verandahs, carports or internal and external window coverings. 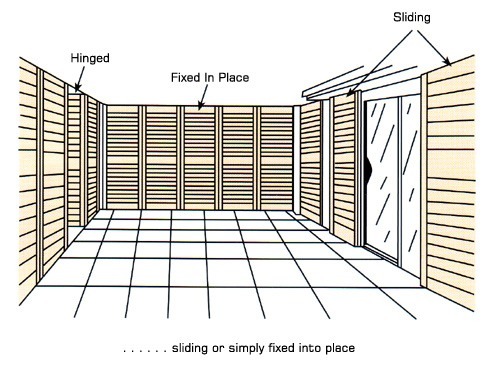 To adjust blade angle simply tilt any blade as they arejoined by a fine rear control bar. Alternatively you canhave the fixed blade option – request Vueline 1500 Series (inset). This is approximate only and based on panels with no framing or H/ware attached.